Extra tires getting in your way? Want to keep them in top condition for next season? Then store them off the ground, and out of the way with this sturdy rack. It's made from industrial strength steel, and it comes with a lifetime warranty, so you can be sure that it will provide adequate strength and durability for any tires you have. Thanks to the adjustable frame, it also adapts to different sizes to provide maximum compatibility and a secure fit. All types of tires, ranging from 24" wide to 32" wide can be stored with plenty of room, using this product. It measures 48" wide, and it comes with all of the hardware required for installation. In just fifteen minutes, you can free up floor space, and protect your seasonal or recreational tires. With a full 300 pound capacity, it is strong enough to support tires and rims together, and the powder coated finish gives it a great look that will hold up for years. Don't just roll them into a corner, and stop using your stack or winter tread for a table in your garage. Improve organization, and make those tires last longer with this high quality storage solution. Uses Hang and store tires when not in use. Keep them off the ground to reduce clutter and prevent damage. Compatibility Hang up to 4 tires with widths from 24-32 inches. Capacity Hang up to 300 lbs. Hooks Included N/A - Comes with rack extension to accommodate tires. Give your unused tires a home, and make them easier to store when you're not using them. 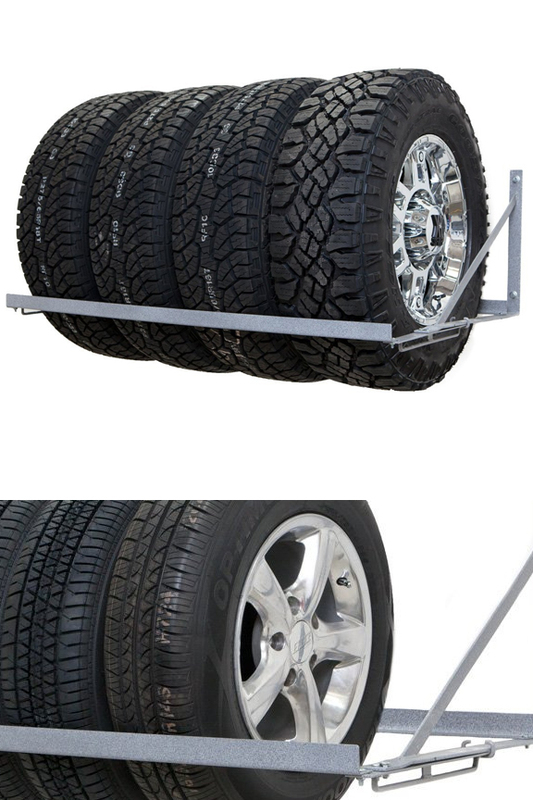 This sturdy rack sorts and elevates up to four tires with rims to make them last longer and reduce clutter. Order Yours Today!